They were my first choice but due to a glitch in getting the materials in from my school, my paperwork was not complete by the deadline and their rules were carved in stone. So, I went to Washington University in St. Louis, where I received a great education despite the fact that I attended slightly more parties than classes. Wash U is generally known more for its pre-med program than as a party school but I didn’t let that stop me. At 19, I graduated from college. Worked full-time all through college, worked full-time while getting my MBA and as an engineer for several years after that. For a while, I taught math and got a second masters at the same time. At 29, I quit working full-time so I could finish my Ph.D.
Well, it hasn’t been completely coincidental that I have done reverse sabbaticals and gone to a university every decade. I find that as a consultant, I get paid for what I know and what I do. So, I may get asked to do a repeated measures Analysis of Variance over and over, for six projects in a row. Or, I may find myself repeatedly getting contracts to write grants for the Department of Education, because I have already gotten several funded. Business is like that. There may be a few rare jobs where you get paid to learn things but those are mostly jobs where you learn things AFTER you have already put in a 40 hour week and those are your other 20 hours. Business hasn’t really changed all that much. Plenty of people buy Microsoft products because that is what they have always bought. If you’re going to hire a consultant to do X, you are pretty safe hiring a consultant who has already done X seven times for satisfied clients. That way, even if the person screws up, no one can blame you, it’s a reasonable choice. So, every ten years or so, I get tired of doing X and I decided to do Y or 7 or purple. More than once, I have been called “insane” for giving up a great opportunity. The irony of that is that the second and third time I was giving up insanely great opportunities that I wouldn’t have had if I had not been “insane” enough to give up the first one. I’ve been an engineer, math teacher, professor, statistician, programmer, consultant – and for thirty years run a business while raising four daughters. And yet, the bizarre fact is that it has all turned out okay. After every “sabbatical” (which, incidentally, has always entailed a HUGE cut in pay because university salaries * blow * compared to the corporate sector), I’ve stepped into a new stream that paid much better and was more challenging than when I left. Not only have I ignored every bit of career advice I was ever given from, “Stick to one thing,” to “Dress for success” to “Don’t have pictures of your children on your desk or you won’t be taken seriously” to “Always show up at work before the boss” to “Don’t express your own opinions”. It occurred to me that I have not so much had a career path as a career random walk. Yet, it has turned out okay, as measured on The Julia Group scale, which is a factor score consisting of (unequally weighted) jelly beans, Chardonnay, time spent laying on tropical beaches, how much I love my children, terabytes and years of marriage to someone who brings me coffee in bed at 9 a.m. So, what now? Well, I have a contract under review with a federal agency, six papers I’m committed to write and the family wants to go to Hawaii. After that? I haven’t the faintest idea. But I’m sure I’ll like it. Because if I don’t, I won’t do it. What Would I Do with JMP? A large part of my day is spent playing with new software and trying to break it. Yes, there are actually grown-ups who get paid to do this for a living. I find it hard to believe myself. My inappropriately named desktop, since it is actually under my desk, runs Mac OS 10.6 and has five virtual machines with Vista, Windows 7 (32 & 64 bit), XP and Ubuntu. There is a supercomputer over my head that I can tap into from here directly that also runs SAS and Stata. So, why would I need JMP? JMP is one of the many things that has been laying around here for the last couple of years that I’d look at every now and then, and think maybe I should do something with this. Lately, three things occurred to me. 1. It runs on a Mac, thus sparing me the 30 seconds of opening a virtual machine, that could then be used for such extremely important tasks as getting jelly beans out of my drawer. 2. It makes pictures, which fits well into my current interest in visual data analysis. I am actually married to one of those people who doesn’t believe anyone should buy software unless it AT LEAST runs on a mac and preferably Linux, too. Learning JMP turned out to be less trouble than finding another husband as good as the one I already have, so I decided to go with that. I had a dataset downloaded from ICPSR and that I had done lots of work on in SAS. I was working on a project with someone who only uses JMP. So, I saved the dataset as a JMP file. We were working on a project to predict who would enlist in the military. I had a sample of > 2,500 high school sophomores who had been asked their plans after graduation. 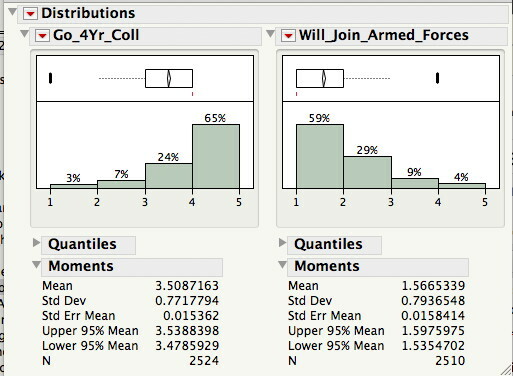 In JMP, I select ANALYZE from the main menu and then DISTRIBUTION. I moved the two variables into the Y column and clicked OK.
Those little red arrows next to almost everything do stuff. For example, when the results window first came up, I didn’t like the looks of it. No, it wasn’t rolling its eyes at me. It had the histogram vertically oriented and a table of Quantiles I had no interest in. Grey arrows expand and contract things. Red arrows give you options. If a grey arrow is pointing dowm and you click it, it hides what is underneath. Conversely, if it is pointing sideways it has hidden stuff underneath and you can click it to expand and see what that is. So. I got rid of the quantiles. Clicking on the red arrow next to each variable gives a whole list of options and some options of the options. I clicked HISTOGRAM OPTIONS and then I clicked on VERTICAL which had been selected by default. Then I selected SHOW PERCENTS. Here is my first picture and my first conclusion. People are a bunch of liars. Anyway, Gilroy says that 12% of military eligible youth show an interest in military service. So, if we put the 4% who said they “definitely will” (=4) and the 9% who said they “probably will” (=3) join the armed services after high school, we get 13% which sound about right. However, 89% say that they definitely or probably will go to a four-year college. Uh, no. First of all, the percentage of freshman students who will graduate is only 73% according to the National Center for Education Statistics and of those only 69% will enroll in a four-year school. So, .73 *.69 = 50.4% and even given that some of the high school drop out has already occurred by the spring of tenth grade, uh, how about no, 89% of you are not going to four-year schools I am sorry to say. Select COLS then NEW COLUMN. In the pop-up window, give it a name and then select FORMULA under column properties. In the functions select CONDITIONAL and pick IF. If RACE = 1 then the new variable = 1. 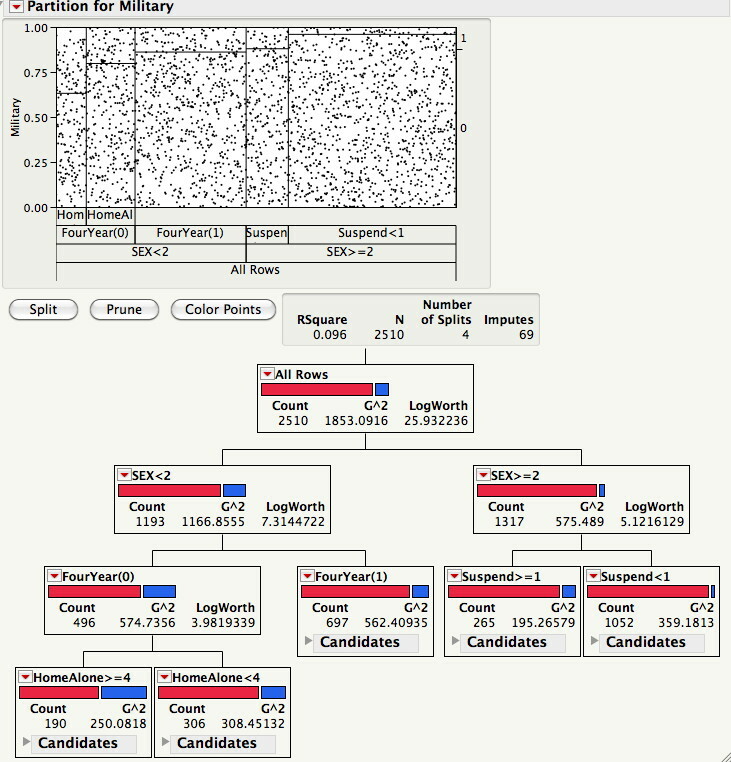 Next, I can go to ANALYZE, MODELING, PARTITION and click on SPLIT a few times and I get my decision tree. It’s a start. I still think race should factor in there and I think the reason it doesn’t is because of that “garbage category” of three for everyone else – Asian, Native American, people who didn’t say. My hypothesis is that if I change that, race will become a factor. Essentially, the same thing I do every day. A miracle has occurred and I have had time to spend evaluating two things that have been on my to-do list forever, JMP and SAS Enterprise Miner. Both of these products are produced by SAS and the first interesting point is that knowing SAS won’t really help at all. That isn’t to say that having some knowledge of programming logic won’t help. In fact, I am taking a data mining course just for fun. It is very interesting because while I have taken plenty of workshops and short courses I haven’t been a student in a regular class for over a decade. In fact, Jenn dropped out of high school, took her GED, went to community college, finished her B.A. at 21, taught school for a while and had her masters degree from USC by 24. So, that is my general view on SAS Enterprise Miner on-demand. I think it has great potential and is worth keeping around. When it grows up, it will do impressive stuff and be a really good teacher. In learning data mining, whether using JMP or Enterprise Miner, background knowledge makes difference. Because I have had decades of experience with both programming and statistics when I see something in JMP like FORMULA > Conditional it makes perfect sense to me as an IF statement. Some people reading this are probably thinking, “Of course”. If you are one of those people you may be proficient with SAS – or SPSS syntax or any number of programming languages. In Enterprise Miner, when I right-click on the Partition Node and see options like Cluster and Stratification, again, I think “of course”. This is why my fellow students hate me. It’s not just me. There were a few posts in this cool blog, Bzst on SAS Enterprise Miner’s On-Demand version. and I agreed with pretty much all of her points. Enterprise Miner is cool and the current on-demand version is a great improvement. 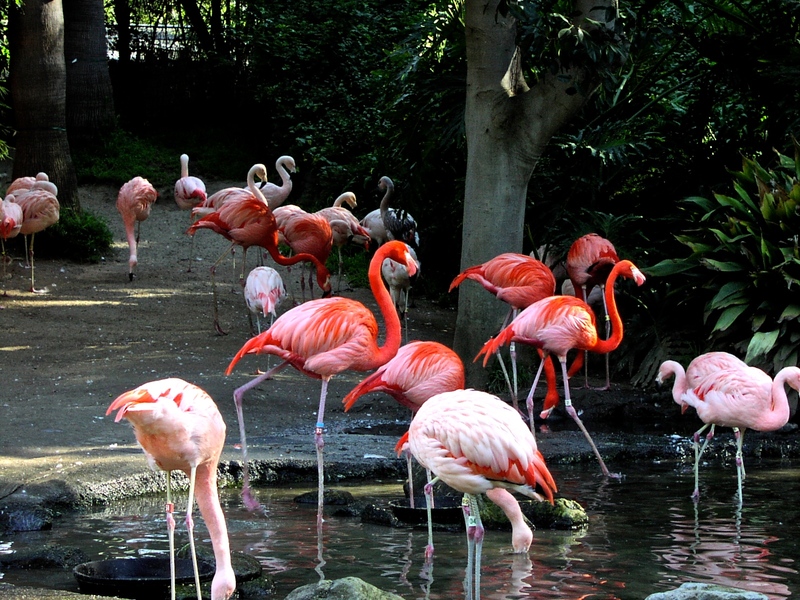 It is much easier to install than the desktop version and as far as the client-server version, it involves over 340,000 steps to install ,one of which (and I may be imagining this) requires a band of marching flamingos. 3. Students like it better than sitting in the lab. They can download and use on their computers. 1. It is not easy. Very little of it is self-evident and even less so if you have never used SAS or JMP. As Dr. Shmuéli said in her posts, most MBA students probably aren’t going to thrilled by the need to download, install and learn another piece of software. On the other hand, those really interested in statistics,software or data mining will probably be pumped about that part. 2. As noted in the BZST blog also, if you don’t have some knowledge of statistics and a general idea of program logic you are going to have a hard time using Enterprise Miner. Some people, and I can’t say I wholly disagree, will say this not a disadvantage. You should know what the heck you are using. 4. It is unreliable. Even while writing this blog on the cool stuff it does, I could not get it to come up to do the cool stuff. 3. The growing pains in the mean time can be REALLY irritating (oh, you have no idea). You know those give-aways you get at conferences? The favorite one I ever saw, which I did not get because they had run out of them, was a magic wand. It was wand-shaped, with sparkles floating inside, they had a vase full of them with a note that this was the magic wand some people seemed to want you to wave to make all of the bugs disappear. It did not have sparkles, much to my disappointment, but SAS Enterprise Guide actually made all of my data problems disappear today and I was happy. Here is my problem – I downloaded a dataset from ICPSR (Interuniversity Consortium for Political and Social Research) that had hundreds of variables, each of which had a user-defined format and a name like V12345. I did not want hundreds of variables. I actually only wanted (I thought) 21. So, first I did this in SAS 9.2 which read in the .stc file using PROC CIMPORT and kept me from getting format errors since I had the nofmterr option. BUT … I still wanted to rename all of these variables and change the formats. I closed SAS and opened up Enterprise Guide. Under EDIT, I turned off the PROTECT DATA. Then, for each of the variables, I right-clicked on the column (actual ctrl-click, since I was using a Mac) and selected properties. This was very efficient for me because I was not actually sure these were the exact variables I wanted and when I saw the labels I could delete some right then. I changed the names, labels and formats. I did not have to do a proc contents, write a drop statement for the variables I didn’t want, a rename statement for the variables I wanted to rename, a label statement for the variables I wanted to relabel and then an attrib statement or some other method of changing the format. Then, I opened a code window and wrote a few lines for all numeric variables to have the -9 value changed to . so it was Missing and didn’t throw off my calculations. Because I was very curious I selected from TASKS > CHARACTERIZE DATA to take a look at what I had. It was kind of sad, really. These data are from a longitudinal study of youth, and the particular variables I had were from their senior year of high school. The sad part was the great disparity between the percentage of students who said they expected to go to a four-year college and the percentage who actually will. Because this was the interesting part, I went to TASKS > MULTIVARIATE > CORRELATIONS (yeah, I wouldn’t have put correlations there, either, but whatever). In short, mother’s and father’s education both relate significantly to every positive educational outcome you can imagine, but mother’s education matters more. I right-clicked on the dataset in the Process Flow window and picked Export, to export it to Excel, since the person I am working with on this project does not have SAS on her computer. Okay, it’s past 1 a.m. and even though it is supercool that I was able to at least look at my data somewhat tonight, I need to go to bed so I can get up tomorrow and work to buy the world’s most spoiled twelve-year-old what she decides she wants next. Today it was a 32G iPhone, but the fact that my sixth-grader has in her pocket more computing power than existed in the world when her grandparents were twelve, well that’s another story. a. There are two kinds of screwdrivers ? I was very excited when I heard that SAS On-Demand was going to offer a cloud version of Enterprise Miner for use in teaching, for free, even. “Was” is the key word in that sentence. Should you do this yourself? Well, it depends. This is very far past an “e” on the Do-it-yourself scale. Do you remember the part in Iron Man where the guy built the Iron Man super hero suit out of spare parts salvaged from a plane crash while trapped in a cave? Well, if you’re that guy, you can do it yourself. Any system that supports the Sun Microsystems Java Runtime Environment (JRE). Typically, this includes Unix, Linux, and various Microsoft Windows operating systems, such as Microsoft Windows XP and Microsoft Windows Vista. Macintosh operating systems are not officially supported. For information about a possible workaround that you could test, see SAS Usage Note 18131. Do not be fooled that everything you need to know about systems requirements is on the page you get when you follow the link system requirements. After you log in to your SAS on-demand account and click on a link to install your software you will see a link about configuring your system for Enterprise Miner. CLICK ON THIS LINK AND READ EVERYTHING OR YOU WILL BE SORRY. You may be tempted to skip over the part about the Java Run Time environment because you just read the part above under systems requirements and you met those. Do not do that. You may be tempted to go to the Sun site and download the latest JRE version. Do not do that either. Do ALL of the stuff on this page linked above. Go to cmd and type javaws -viewer. If you don’t have JRE 1.6.0_18 enabled (and who does?) go to the link on that page and download it. It is < NOT > the latest version. Follow the directions on the page that I told you to read every word of and uncheck all of the other versions you may have installed so that only 1.6.0_18 is enabled. Now … try starting SAS On Demand for Academic: Enterprise Miner by going back to that page and clicking on the second link. It should start. Enterprise Miner can be really slow. At first, I thought it wasn’t working. I switched to a better connection and a faster computer (it wasn’t hard,I had to roll my desk chair a few feet but being the finely-tuned athletic machine that I am, I managed) . My advice is if you have several computers, use the best one for this. For a lot of things, the speed of connection and how much RAM you have may not make a difference. This is not one of those things. But…. you have no data, do you? Your problem may be that you are not an instructor. Only instructors can upload data to the course. If that’s your problem, there’s not much I can do for you. If you are an instructor, go to the instructor home page > course information. Scroll down and you will find, in about the middle of the page, instructions on how to upload your data. You can use any FTP program. In fact, even though Enterprise Miner does not run on the Macintosh my data happened to be on a Mac and I uploaded it using Fetch. It worked fine. If your data DON’T upload fine, check the settings on your FTP programs. A lot of organizations have set the default to be SFTP. SAS didn’t seem to like this. I changed it to FTP and my data uploaded happily away. The BLAHs will be replaced with your course specific information. If you are teaching more than one course, when you upload your data and when you use the libname statement, be sure you include the name for THISCOURSE. Otherwise, you won’t be the first professor to have uploaded the data for the wrong course and have a class of very confused students. You won’t be the last, either. Okay, you have uploaded your data to your directory and opened Enterprise Miner. Now what? Create a new project. Go to FILE > NEW > PROJECT. Give it a name. I named mine Joe. On second thought, I should have named it Bob, because when you spell it backwards, it’s still Bob. Open the program editor window. I thought when I went to the FILE menu and picked NEW I would have the option for program, code or something. No. See that little thing that looks like the program editor window that you wouldn’t have noticed if you weren’t specifically looking for it? That’s it. Run the Libname statement above, replacing the BLAHs and THISCOURSE to match your actual directory. Okay, it is running, you have data uploaded, a project open and your library available within the project. The next thing I would do is click on the Help menu (honest) and start reading whatever interests you, like getting started. Unlike most documentation which is written like someone pasted a web page into Babelfish, this is actually easy to follow, well-written and less boring than watching paint dry. I now have Enterprise Miner working on THREE computers, two using the on-demand version and one with Enterprise Miner for Desktop. Someone should bring me a prize. But no one did.